Welcome to Bennetts taxis and Minibuses. Established since 1928, we are the longest running taxi company in Tamworth. We are a professional, reliable, taxi firm, who put our customers’ needs at the top of our agenda. Constantly looking for ways to improve our service and save our customers money we are pleased to announce our new Freephone number 0800 999 5444 with effect from 7 May 2014. In addition to this, to make it even easier for our customers to book their taxis, we will soon be offering our own brand new mobile app. With vehicles ranging from saloons, to 8 seater minibuses to wheelchair accessible, we are confident we have suitable vehicles to cover every eventuality at competitive prices. No job too big, no job too small, we are happy to help. Whether it be airport transfers, courier services, group nights out or just a visit to the local shops we will get you there. We also like to work with local businesses and offer monthly account facilities and with email booking facilities to ensure our account customers confidently know their bookings are secure. With meet and greet airport services also available, overseas visitors will be well looked after. We are a family owned, family run organisation and therefore like to think we treat our customers as family by going that extra mile. 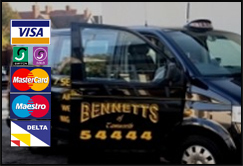 See our reviews from some of our existing customers who are happy to recommend Bennetts as their preferred taxi provider.